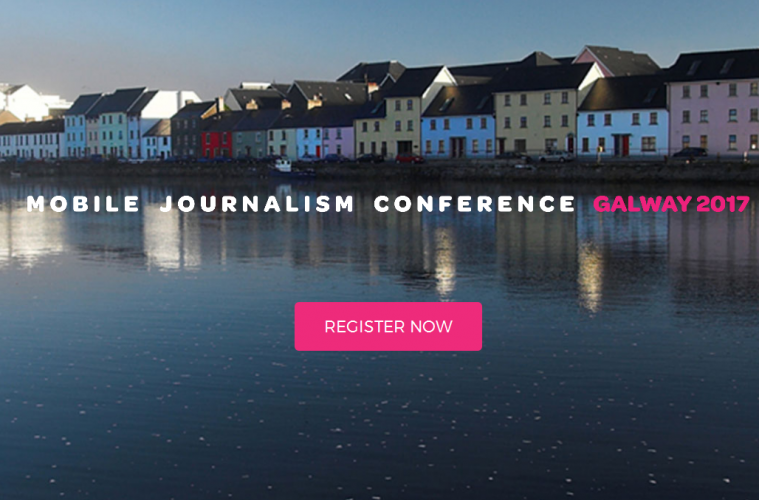 After two successful years in Dublin, RTÉ Mojocon is heading to Galway city. From Thursday 4th – Saturday 6th May, the international conference on mobile journalism, mobile content creation, mobile photography and new technology will be taking up residence in the Radisson Blu Hotel, Galway. Following positive feedback from previous delegates, RTÉ Mojocon has added an extra day, to create a three-day conference with plenary sessions from successful professionals, workshops with industry experts, a mojo exhibition and all the popular fringe events, including photo-walks, exhibitions and pub crawls. Early bird tickets have already sold out, but a number of the 300 three-day tickets are still available at https://mojocon.rte.ie/. RTÉ Mojocon will again showcase the wealth and breadth of pioneering work being done by media organisations, broadcasters, companies and individuals around the globe to truly explore and develop the potential of smart devices as high-quality content creation and consumption tools. Michael Rosenblum – For nearly 30 years, Michael has been on the cutting edge of the digital ‘videojournalist’ revolution. Michael was President and founder of NYT TV and in partnership with Al Gore, conceived of and founded Current TV. He has designed, built and implemented VJ-driven news channels around the world. As a producer, Rosenblum has produced or overseen production on more than five thousand hours of programming for both network and cable television, including his recent groundbreaking 5 Takes series for Discovery which has completely rewritten the production paradigm. He is an adjunct professor of communication at New York University and at The Bauhaus in Germany. His Brussels-based Rosenblum Institute trains European journalists to work as VJs. He is an author and a regular blogger for The Guardian (UK) and The Huffington Post. Ilicco Elia – A mojo pioneer and Head of Mobile at global marketing and technology agency DigitasLBi with overall responsibility for mobile product development and innovation, developing award-winning mobile strategies for the agency’s portfolio of global brands, and helping them take advantage of the ubiquity of mobile as an integral part of DigitasLBi’s blended offering. Ilicco has been named in The Guardian’s top 100 most influential people in media and was placed at #7 in The Drum’s Mobile Top 50 list. Sarah Hill – Award-winning Storyteller and CEO & Chief Storyteller for StoryUP, a VR native media company that creates purpose-led stories for brands and VR features for news outlets. Sarah is a former interactive news anchor for the NBC & CBS affiliates in mid-Missouri. Her team at KOMU-TV pioneered the use of multi-way video chat during a newscast. Most recently, her team produced VR documentaries from the Amazon and eastern Congo about energy poverty. Full conference details, including speakers and tickets are available at http://mojocon.rte.ie.